CEM I 52.5N Portland Cement is a hydraulic binder according to SANS 50197. The main component is Portland cement clinker, finely ground together with calcium sulphate, which controls the setting time for Ohorongo CEM I 52.5N. Stringent production control during the entire production process ensures consisitent high quality. Ohorongo CEM I 52.5N Portland Cement is designed to meet a strength class 52.5 with a normal early strength “N”. Ohorongo CEM I 52.5N Portland Cement can be used in applications where a higher strength class is required. Typical applications are reinforced concrete, masonry products, roller compacted concrete and shotcrete. Ohorongo CEM I 52.5N is compatible with commercial chemical admixtures. 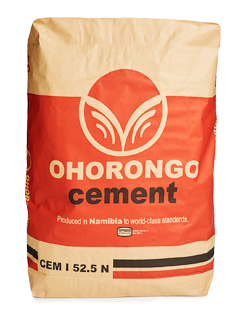 Ohorongo Cement is distributed in 2 ton bags and bulk tankers. Bulk storage silos should be dry and vapor tight. Cement bags should be protected from moisture and kept dry, preferably off ground by means of pallets or timber, preventing moisture contact. Bags should be stored away from direct sunlight, or should be covered by a roof or sheeting. Stacking should be kept to a maximum of two bags high to avoid compaction of cement bags at the bottom.